Another fantastic read, and this one sneaks up on you, which made it that much better. A great writing style, a nice easy flow to the story. No bumps, no awkward moments, no bad acting in this one! 😉 Ten Tiny Breaths played out perfectly in my head, and had a perfect dose of angst. But better yet, it’s… charming. I don’t know of a better way to describe it. It borders on a darker feel, because of a horrific tragedy that pretty much annihilated the heroine’s life as she knew it. Her coping mechanisms have all but isolated her from ever connecting to anyone again. And while she remains stoic and even hardened, she’s fantastic at deflecting. I’m not Kacey Cleary anymore. I’m an empty shell who cracks inappropriate jokes and feels nothing. I’m a Kacey imposter. It’s moody… she’s moody, but not in a moping, tragic, downtrodden way. ‘Cause she’s kinda funny (and relateable). Her sarcastic wit keeps the story light, while holding everyone in her path at a distance. Except for us, of course. We are her. We get to experience every one of her nightmares, panic attacks, and triggers. But no worries. She’s a survivor. A fighter. A protector. And she doesn’t need anybody. Won’t let anyone near. Ever. Even his name out loud sounds hot. Trent. Trent. Trent. Stop it, Kace. Oh boy is he in for it. And so is she. 😉 And we. Geybie: Does the story have a happy ending? What I mean is will the two main characters finally get together or not? Kristi: YES, must know. Does this have a happy ending?? Emma: Not telling, but you will *…* at the end. Tiffany: Loved Ten Tiny Breaths!!!! K.a. Tucker’s other books are amazing too!!! She’s has some serious mad writing skills ! Kristi: So, I am very much into this book but for some reason I’m terrified my heart is going to get crushed!!! I’m only 30% into it so we shall see!! Maryse’s Book Blog: Ohhhhhhhhhhhh noooooooo. Is my brain right? Did I just figure it out? … Oh whoa. … “Everything is perfect.” Mmmmhmmmm.. Ominous words if I’ve ever heard ’em. What awaits me? Kristi: SOOO GOOD!!! Just finished and I LOVED IT!!! WOW!! Jacque: Omg! Had to stay up to finish! Great book! 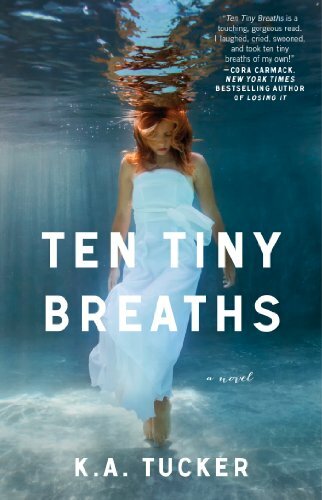 Takisha: Just finished Ten Tiny Breaths – at *something*% I knew where it was going eeek! Good book! Maryse’s Book Blog: I KNOW!!! I loved when my brain clued in. Nice!!! So what’s it about? Tragic circumstances and suspicious events entice twenty-year old Kacey and her fifteen year old sister, Livie, to escape their current situation. Our lives, all of our belongings have been reduced to one suitcase each. It’s all we managed to throw together in our rush out of Uncle Raymonds and Aunt Darla’s house. No matter, I tell myself as I throw an arm over my sister’s shoulders in a side hug. We have each other. That’s all that matters. Once they arrive in Miami, they embark on a new, independent life together. Living on a meager income forces them into a shabby-ish apartment complex with neighbors that appear to have their own skeletons in the closet. Which seems threatening in itself, but was one of my favorite parts of the story. This mismatched group of loners, each “starting again” really tugged at my heart. Mismatched but perfectly matched. As they come to depend on each other, help each other, and trust each other, the story really takes on a life of it’s own. Inside, panic is rising. Livie’s getting too attached to these people. Attachments are bad. Attachments lead to hurt. Check out the old cover when it was still “indie”! Right. And one mustn’t forget those skeletons… 😉 They start rattling eventually and I was delightedly startled right out of my comfort zone! I didn’t even see it coming, until I did and then it was too late. It’s a story of tragedy, rising from the ashes, and learning to connect again. He’s like air after years under water. Learning to trust yourself. Only to realize… maybe you had it right, the first time. The nightmares are back, only they’re worse. A million times worse. Or maybe not. 😉 I’ll let you decide. Loved it!! A MUST READ! I wont say any more. The shock value from the very start to the very end must be experienced blindly for full impact. Just know I think you should read it. P.S. Livie gets book #2!! Expected release March/April 2013 —> See the news on the author’s blog. I just finished it tonight. I loved it!!! Yea i loved this one after i read your review and reflected on how this read made me feel…i loved it! Loved the characters..yea I loved it! Loved this book! So excited to read about Livie’s story. Can’t get it on Nook 🙁 UGHHH!!! This book was amazing. I Absolutely Loved it. Can’t wait to read this! In the middle of Jennifer Foor’s Mitchell family saga. Bought after your recommendation..loved it…i did guess what was happening…and it made cry..if a book can make me cry its a good book. Loved this book, great characters, great story. Just finished this book and loved it!! I really love Trent. And the story is so real and heart wrenching. Maryse, you are right, this is a must read (especially by those who contemplate drinking and driving). Just finished this morning before leaving for work…..What a way to strat the day…I loved the story, amazing to turn such a tragedy into a beautiful story of forgiveness and love……..